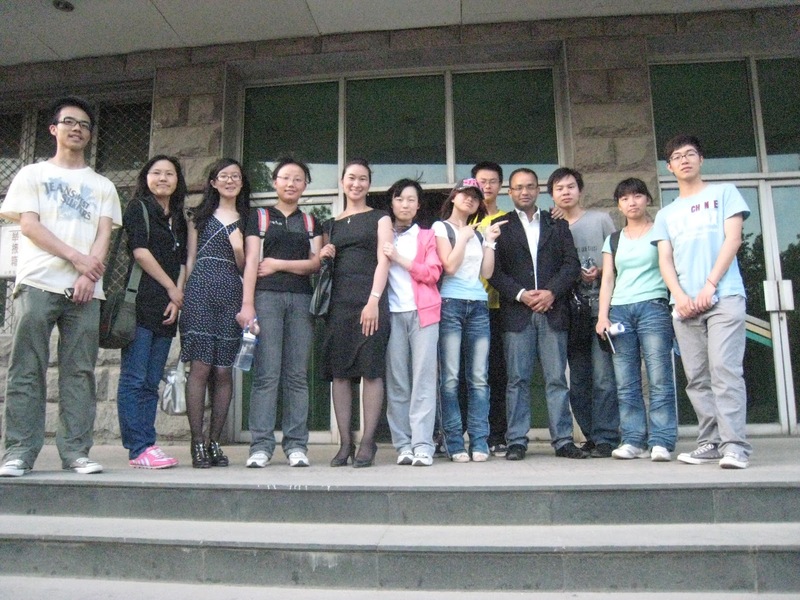 Desi In China: The Goodbyes at the Univ. After the entire fiasco around language issues with the students of the University and the ego-beating that I took, with my confidence in my English skills crumbling at every step.... finally it was time to say goodbye. I suddenly realized that with some basic human emotions - like the pleasure on meeting and the heaviness in goodbyes - there was really nothing lost in translation. These are universal and universally understood. The students were genuinely distressed to see us go. A few interactions alone had forged a bond that they were reluctant to break. Even though the students from our University (girls or otherwise), never sent me text messages asking me to 'play with them' (as did some evidently playful young girl students from Dan and Tom's University! ), still it was clear that they seemed to have got some sort of value from our sessions and really made us feel special when it was time for us to leave. The students gifted Andrea and me with some lovely hand made cutouts and some calligraphy art in Chinese (in equally elaborate handmade envelops). I really appreciate the gesture though I had to take 4 pictures of the calligraphy in all possible orientations and mail them across to Emily to figure out which 'side was up'. 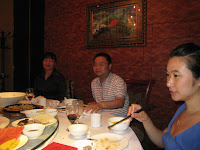 The last engagement with the University was a formal dinner thrown in our honour. It was a lavish spread with some extremely good Chinese wine that did not fall into any of the categories I had listed in this blog earlier. There was an amazing amount of food, and phenomenal food presentation. Profs W & Z had - earlier in the day - conducted an elaborate 8 stage selection process in the University to identify faculty members who could potentially interpret and hold communication in an Indian-English environment and managed to select 4 such individuals who were ready for the challenge. And just in case they could not meet the challenge, there was always the wine to fall back upon. 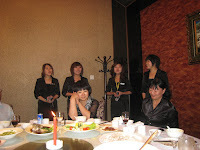 I understand that it is a strange Chinese custom to try and get your guest drunk (gosh.. I so love this country... every pleasure is a custom! ), but it's possible that the makers of such a custom never accounted for a Punjabi Indian guest. I played along till the bottle was over and Prof. Z had professed his 'friendship' for me nineteen times (from his third drink to his sixth). I had almost resigned myself to the fact that he was taking me home with him when, fortunately, the 20 course meal concluded with some waitresses singing some songs for us. Prof. W gifted us a silver coin each with the University's name and seal on it. A great reminder of what we had accomplished here. Thank you Prof W, and thank you Prof. Z.
Folks I would be being less than honest if I don't confess that the entire project was really very gratifying and left a sense of achievement. Students are students everywhere... eager to lap up any grain of wisdom thrown their way and eager to internalize it for their future consumption. The language barriers were pretty minor in hindsight and the efforts they made to comprehend and participate were really commendable. 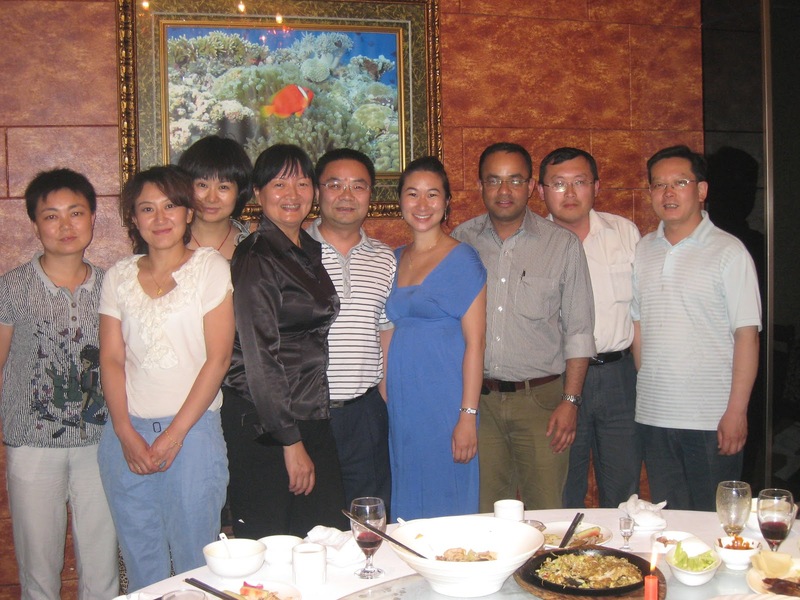 I wouldn't claim to have changed any lives in Shijazhuang, but I sure hope I left a little bit of myself there anyway.